Want Me To Promote Your Internet Marketing Product? Contest Sponsorships Now Available! Matt Gill, Eric Louviere & I to promote your Internet marketing product or service? Valuable promotion on location before during & after a HUGE live Internet marketing seminar? Your stuff promoted to a LIVE Internet audience of thousands of simultaneous viewers online? A promotional mailing featuring your products? When you become a sponsor of my upcoming Internet marketing contest you’ll get all these things! To become a sponsor you don’t even need to cough up with a ton of money! All you need to do is donate your own quality Internet marketing training, coaching, 1-on-1 consultations, software or services to the contest to be given away as a prize. If you’d really like to donate cash or gadgets, we wouldn’t mind. As you know, contest marketing has become one of the hottest & most effective promotional tactic that you can use online. I’m holding a HUGE Internet marketing contest RIGHT NOW using my contest software and I’d like to promote your products to all our contestants & seminar attendees. Use the Contact Us form on my blog to tell me what you’d like to donate, the retail value of your prize & why you think it’s a good prize. I’ll review all the submissions ASAP & get back to you with an answer. 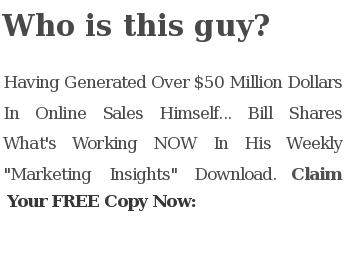 This entry was posted in Contest Marketing and tagged billmcintosh, contest marketing, contest software, eric louviere, internet marketing seminar, internet marketing training, matt gill, online promotion, product contest, seminar sponsor, sponsorship by Bill McIntosh. Bookmark the permalink.